PC designer Jeffrey Stephenson, whose work we have featured before, is back with his latest creation. There are case mods, and then there are ultra-mod case mods. This mod, is, well, mod. Have words lost all meaning for you yet? That's all right. You won't really need them to admire this sleek, svelte, sixties-inspired PC. Dutch painter Piet Mondrian began his famous black-grid paintings while living in Paris during the brief period between World War I and World War II. But the patterns inspired by his works were absolutely everywhere in the 1960s, particularly in fashion. 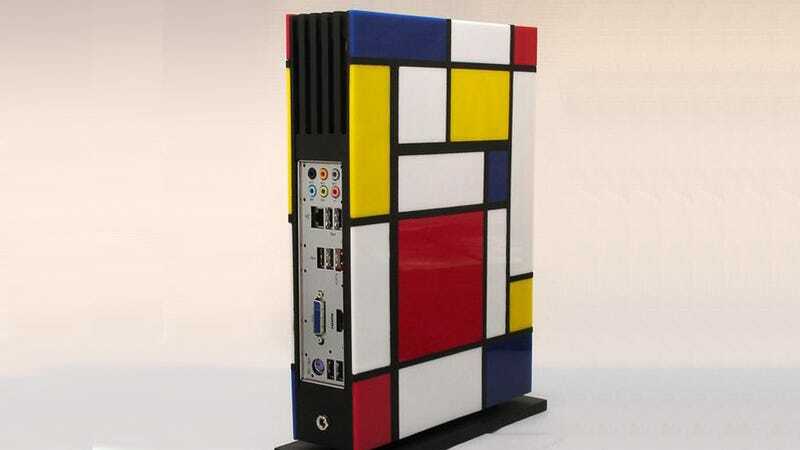 Given the blocky, modular way Windows 8 can look, somehow a Mondrian look seems entirely appropriate. Hit the gallery for a bunch more screenshots, or Stephenson's site for a huge set of photos showing off the (painstaking) construction process as well as the final product.